A few weeks ago, analysts at Morgan Stanley downgraded the semiconductor industry to "cautious" -- the firm's version of saying that it thinks a particular sector will underperform the stock market in the next year. Concerns cited were rich valuations after a great two-year run, inventories at 10-year highs, and little room for error in the delivery of new supply. Many semiconductor stocks promptly retreated, fulfilling the prognostication. The chipmaking industry is cyclical, subject to wild swings because of small changes in supply and demand. However, given the solid fundamentals and long-term outlook for semiconductors, one firm's current bearish viewpoint could be your chance for gain. Brilliant call or 20/20 hindsight? Part of the reasoning behind Morgan Stanley's cautious outlook on semiconductors is the stellar run chip stocks have had since 2016. The sector -- as measured by the iShares PHLX Semiconductor ETF (NASDAQ:SOXX) -- has handily beaten the broader stock market. 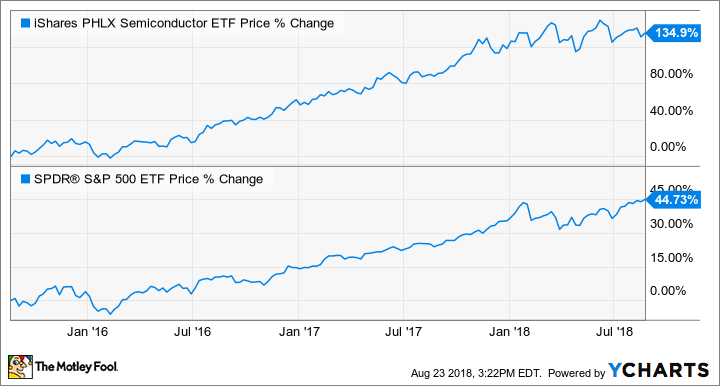 However, while still sporting a high-single-digit gain year-to-date, semiconductor stocks have been moving sideways for the better part of 2018. An extended period of time where prices go nowhere -- a "time" correction versus a "price" correction -- essentially hits the reset button if profits continue to rise. Besides, there have been problems with the sector that are getting hidden to all except investors in individual stocks. The PHLX Semiconductor Index is heavily concentrated in heavyweight names. The top three holdings -- Qualcomm, NVIDIA, and Texas Instruments -- make up 26% of the entire fund. All three stocks are flying near all-time or 52-week highs, keeping the overall index looking healthy. Meanwhile, there has been a lot of pain for smaller chipmakers. Even prior to the Morgan Stanley downgrade, many had been hit with trade war worries, not-as-good-as-expected growth numbers, and growing pains as the industry adapts to the movement to embed chips into billions of devices (the Internet of Things). And when there's pain, there are opportunities to buy at a discount. After facing headwinds so far this year, there are plenty of chipmakers that are now trading at a discount in spite of rosy outlooks. Here are three that I think are on clearance. Chart by author. Data source: Yahoo Finance and company quarterly earnings reports. Cypress sells various digital memory and connectivity chips, especially to auto manufacturers and other industrial equipment companies. The company is just returning to profitability after transforming itself from a commoditized product maker to a specialty connectivity and programmable chipmaker. Growth has been modest this year, but management sees sales reaccelerating during the back half of the year. Looking farther down the road, though, Cypress' prospects look solid, as digital and connected tech becomes increasingly important in cars and industry in general. The company is also seeing cross-selling benefits from being able to offer memory chips along with its more specialized offerings. Applied Materials is a different take on the industry, as the company sells equipment, designs systems, and engineers materials for chip manufacturing. The stock thus offers broad exposure to every corner of the electronic device industry, from memory chips to new display technology like OLED. Shares have fallen since peaking in March, due to management's near-term outlook weakening compared with the last few quarters. However, as the world goes digital, Applied Materials is a great way to play the overall rise in importance of electronic devices. Skyworks Solutions made a name for itself providing the connection-enabling chips for smartphones like Apple's iPhone. The company has leveraged its strong performance over the last decade to provide the same kind of capabilities for other devices, from medical equipment to smartwatches to security cameras. Skyworks' bread and butter is still smartphones, though, where growth has tapered off in recent years. While diversifying its revenue streams is still important, new 5G mobile networks could soon breathe life back into the smartphone market. Chips that work with the new network will be needed, providing potentially hundreds of millions of new devices that will need to be upgraded in the years ahead as 5G debuts. It's been a tough year for many chip stocks, and recent analyst pessimism hasn't helped. However, the outlook for these companies is solid, and a downturn for many spells opportunity for investors. If things do in fact get worse, patience will be required. But long-term, manufacturers of the building blocks of the future should be a great core portfolio holding.